A few weeks ago, I met Danielle Metcalfe-Chenail at the SMBYEG; I had been meaning to talk to her because I heard that she was a local writer interested in Canadian aviation history. We got to talking, and when I mentioned Retro Reporter she remarked that she should introduce me to another of her author friends who wrote a novel about an alternate 1930s world where the Chinese developed the west coast, everyone had a ghost and the lead character was a femme fatale detective. Well, I was hooked. As soon as I could, I sent SG Wong an email to ask if I could feature her novel on my blog. I rambled on about how much I love vintage, writing, and sci-fi/diesel punk and instead of thinking that I was a loon we made a date to meet up over gelato (which was the preferred outcome, of course). 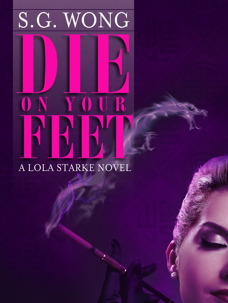 First in the Lola Starke series, Die On Your Feet introduces us to the world of Crescent City, where the Chinese are the dominant cultural force and Ghosts are very real. Lola Starke isn’t your normal gumshoe—unless normal includes a trust fund, a glamourous actress mother and a ghostly smart–mouth with illusions of investigative genius. But it’s not all fast talk and mah–jongg games for our prickly private eye, as she’s drawn into the slums of the City on the tail of a missing heroin addict and into the clutches of an old enemy. It’s every woman for herself in this story of broken dreams, hidden agendas and ghostly vengeance. 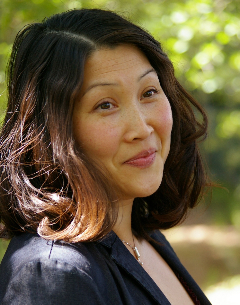 Wong was born in Hong Kong, moved to Vancouver and then Edmonton as a small child and lived here until she completed her BA (Honours) in English at the University of Alberta before moving to Japan - where she met and fell in love with a man from Kansas. They have two kids, and the idea of Lola Starke first came to her when she was nursing her oldest in the middle of the night, by the light of a small lamp. Wong created her seedy and paranormal 1930s Los Angeles partially because she loved film noir and sci-fi, but also because she knew she couldn't showcase a historically accurate LA. "I wanted the same glamour and aesthetic with the juxtaposition of the underbelly, but I wanted there to be a Chinese ethnicity," she said, adding that as someone who is a visible minority, she wanted Starke to be one too, which she writes about here. It took Wong eight years to get Die On Your Feet published, and struggled to find a print publisher that had a pre-existing list of books it fit in with. Finally, she took the digital-publishing approach, and published through Carina Press. "I just want people to read it and enjoy it," she said. BUT I am also excited to host a give way for Die On Your Feet in honour of reaching over 300 subscribers from Blogger, Bloglovin & RSS subscription. Enter the giveaway below! Winners will be notified and have the book emailed to them. Even if you don't have an e-reader, you can download Adobe's free e-reader onto your computer. So excited for you, SG Wong! Can't wait to read the book. Wow this novel sounds amazing. I am definitely going to try to read it, giveaway or not. Thanks for posting! Having grown up on the west coast, I must say, I'm thoroughly intrigued by the premise of this book's plot and am itching to read this book now, too. What a cool giveaway, Laurie, thank you very much for holding it. O my! Thanks for introducing us to SG Wong and her imagination. My kindle is willing and ready to receive;). this book sounds like and exciting read. It was great meeting you, Laurie, and I'm so glad you connected with S.G. Wong. Whoever wins her book is lucky!